Very large with long legs and a long, slender neck. Plumage ash-grey overall. Head and upper neck black. Red skin on the top of head. Nape white. Tertials elongated and ruffled, giving the impression of a bushy tail. In flight, dark grey remiges contrasting with the rest of the wing, which is ashy-grey. Shows a small white mark at the base of the inner primaries. Slow wingbeats. Neck and legs extended in flight. Juvenile: distinguished from the adult by the unmarked brown head and upper neck, plumage with brown markings, and less bushy tertials. Voice: loud, far-carrying call, a trilling “krou". L. 96-119 cm ; W. 180-222 cm. 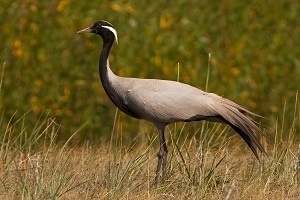 On average, slightly smaller than the Common Crane, with a similar shape but a rounder head, a slightly shorter bill, and the neck slimmer and shorter. Body and wing-coverts ashy grey as in the Common Crane. At rest, the tertials are long, pointed, and narrow. The black on the head extends down onto the centre of the chest, and there are long pectoral feathers. The crown is white and there is no red on the head. 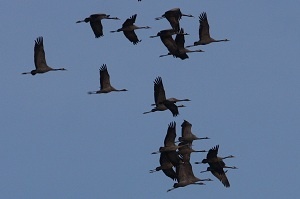 In flight, the contrast between the remiges and coverts is less clear cut and less marked than in the Common Crane, and the legs are a little shorter. Juvenile: duller and browner above than the adult. The head is generally pale, while the neck and chest are darker. Voice: call similar to the Common Crane but slightly higher-pitched. L. 85-100 cm ; W. 155-180 cm. Similar species : Common Crane.